God created us as integrated relational beings so that our outward actions and relationships with others flow out from the core condition of our inner life. For pastors, it is paramount to maintain personal stewardship of oneself in order to sustain vibrant pastoral leadership for a lifetime. Who the pastor is will emerge in what the pastor does. How’s your mental and emotional wellbeing? How are you doing with family, friends, and your congregation? How are your physical health, nutrition, fitness, and energy levels? How are you stimulating your mind toward growth and creativity? How are financial pressures limiting your ability to flourish and lead? The greatest foundation for sustained longevity in ministry is a strong internal core. A strong internal core will provide a firm platform for sustaining a lifetime of outward ministry toward others while helping to avoid the likelihood of vocational burnout, vulnerability to temptation, and deterioration of relationships. 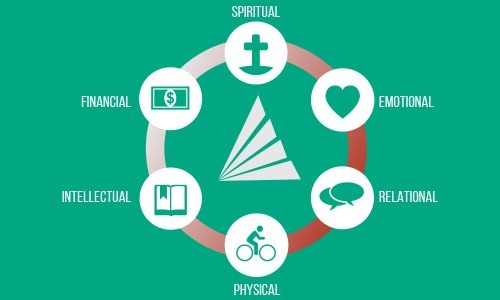 These six clergy self-care domains form the internal core of the pastor’s life. In real life, these domains are fully integrated, but for purposes of explanation and planning, they are presented separately.